Toss potatoes, garlic, and olive oil together. Empty them onto a baking pan, and then roast them for 45 minutes to 1 hour in the preheated oven. When they’re glistening brown, I lay them on some paper towels and sprinkle with coarse sea salt. You don’t want them to go on the salad when hot, so cool potatoes on some paper towels for about 10 minutes. *Alternately you can pan fry, but only add the garlic the last few minutes. Put some water on for the eggs, put a matchstick into the pot, and then, when boiling, lower in the eggs and boil for exactly 1 minute. Remove and set aside. Tear the romaine leaves into edible sizes and toss with the remaining 3 to 4 tablespoons olive oil to coat well but lightly. Sprinkle over the salt and several grinds of pepper and toss again. Shake over about 6 drops of Worcestershire sauce, drizzle over the lemon juice, break in the eggs, and toss to blend. Correct the seasoning. 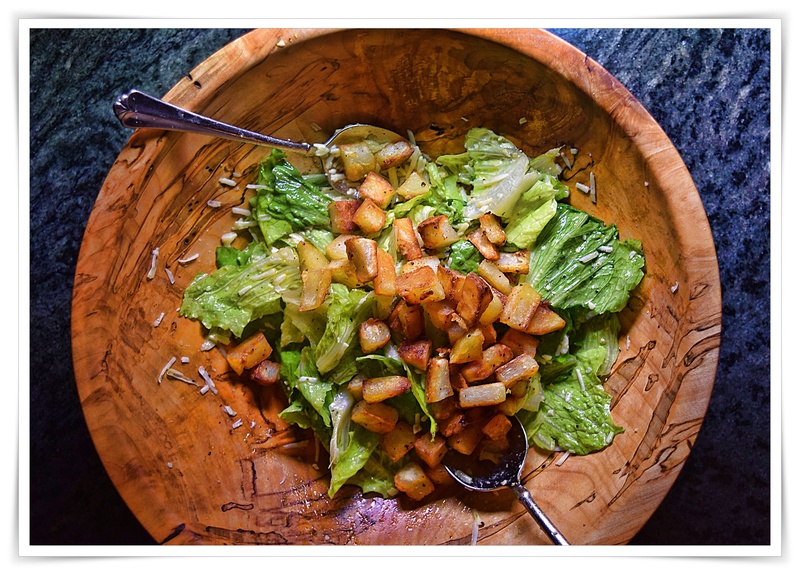 Toss with the cheese and then with the potato croutons at the very last-minute, as you bring it to the table – no sooner, or the salad will wilt.